Brushes Corp. provides custom engineered brushes for virtually any application that utilizes a twisted-in wire brush. Utilizing our 45-years of manufacturing experience and expertise, we can develop a brush that meets all your specified criteria at a very competitive price. Constructing the exact brush for your application! The first step in designing a brush that will provide superior performance is to select a stem design, material, length, and diameter. Does your brush require flexibility, stiffness, abrasion, chemical or corrosion resistance? We can recommend the correct stem material for your application. Your choice of fill bristles are twisted between two (2) stem wires. Your choice of fill bristles are twisted between four (4) stem wires. Two (2) layers of your choice of fill bristles are twisted between four (4) stem wires. Our sister company, Malin Co., can provide any type wire, from the routine to the exotic. They can also provide wire and fills that meet military and government specifications. Plastic encapsulation, tapered trim, turned tuft end, looped end, handles, and adaptors. Lead Times Due to the current business climate, our lead-times vary based on material availability. 1-800-967-9697 for the lead-time on this product. As with the stem materials and design, our recommendation for fill materials will be based upon your application requirements – flexibility, stiffness, abrasion, chemical or corrosion resistance. Aluminum, copper, phosphor bronze brass, nickel, silver. Rust-proof and spark resistant, brass provides gentle brushing action. Similar to brass with better shape retention. Typically used in applications where abrasion is required in dry environments. High carbon is utilized for deep cutting where aggressive abrasion is required. Rust-proof and strong and ideal for applications that involve stainless steel or aluminum. Will not leave ferrous deposits. Flat wire is the most aggressive brushing material available. Crimped Brush Bristles or Straight Brush Bristles? 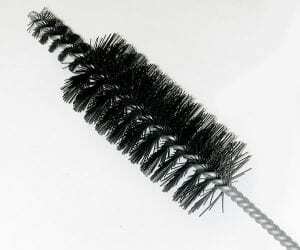 A crimped, or wavy, bristle extends the life of the brush and is ideal for abrasive cleaning. Straight bristles are softer and more flexible. Generally used in washing, light deburring and polishing applications. Dark brown bassine is an excellent material for heavy-duty scrub brushes. A blend of tampico and palmyra fibers at an economical cost. Used in medium scrubbing. A selected grade of polished tampico, patent is slightly stiffer and more durable. Palmyra is a medium coarse fiber. Palmyra stalks are very coarse, stiff, low cost fibers. Tampico is an off-white fiber that holds liquids well, is gentle to polished surfaces, and resistant to high temperatures. Natural bristle will retain enormous amounts of water and ideal for wet applications. Horsehair brushes are resilient and long lasting, ideal for polished surfaces and can be blended with a variety of other materials. Typically used for applications in corrosive environments with acids and alkalis. Tough and long wearing, Nylon discourages bacterial growth and resists most acids. Excellent for industrial and food service applications. Resists acids, alkalis and organic solvents. Excellent for washing, polishing, and soft wiping of delicate surfaces. Ideal for acidic environments and outdoors. Does not absorb moisture and slightly stiffer than nylon. Resists abrasion and most acids and solvents. Does not absorb moisture. Can be extruded in a variety of shapes. Note: not UV stable. These heavy-duty durable bristles that are chemical, bacterial and mildew resistant.